We use a state of the art, self-ligating bracket made by the only American made orthodontic manufacturer. Colors around each bracket can be added (but are not needed) as most kids enjoy this part of treatment. Many adults and older kids prefer a less noticeable, more esthetic type of braces. 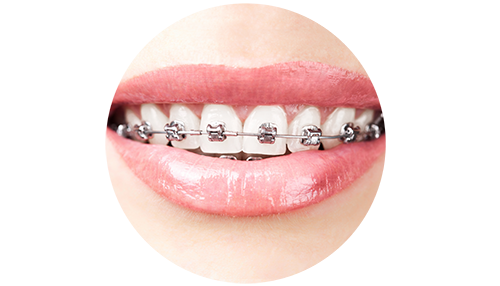 We use a clear type of brace that does not require elastic ties or stain, and will look great throughout treatment. These braces work just as well as the metal ones. Dr. Shoff is Invisalign certified and is happy to provide this completely invisible, clear alternative to braces. Invisalign may not be as effective in treating some types of orthodontic problems, but Dr. Shoff will give you his honest assessment of your bite at your free consultation. The best time for orthodontic treatment varies for each individual. The ideal time is when treatment results can be achieved the easiest and most efficient for the patient. The American Association of Orthodontists recommends that children see an orthodontist by age 7. Though most children will not need treatment at this age, it is a great age to screen for any growth or tooth eruption problems that may be better treated at this time. Many adults were not given the opportunity to pursue orthodontic treatment as a child. Advancements in the industry have given us a better understanding of the benefits of an ideal bite and smile, so we provide many options for adult orthodontics.